Throughout the Oil & Gas Industry, the corrosivity of fluids and the effectiveness of corrosion inhibitors are critical to keeping operations reliable, safe and cost-effective. 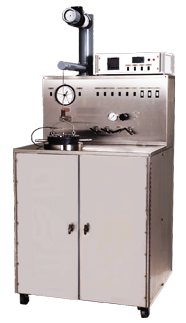 The Model 5617 Corrosion Test Apparatus is designed to test the reaction rate of corrosive liquids on metals that are subjected to high pressure and high temperature (HPHT) under dynamic conditions. The Model 5617 is designed to help engineers maximize their testing productivity and optimize test repeatability. The chamber of the instrument can hold up to twenty glass sample bottles with corrosion-resistant caps during a single test. Each bottle may contain a different metal coupon and sample fluid if desired. Corrosion rates are determined by weight loss of each coupon. Alternatively, the instrument can be ordered to hold larger sample bottles. The test cylinder’s pressure is easily set. During a test, the pressure control gauge controls a pump and release valve to automatically maintain the preset pressure. The automatic temperature control can regulate the temperature heat-up rate which has a maximum of 5.4°F/ 3°C per minute. Enhanced user safety in the Model 5617 begins with a remote control panel. This control panel enables the user to monitor and control the instrument’s pressure and temperature from a safe distance. The pressurization system safely pressurizes and depressurizes the test cylinder. The system includes user-adjustable upper and lower pressure set-points which prevent over and under- pressure conditions during a test. Pressure and temperature can be automatically tracked via an optional Model 5270 Data Acquisition and Control System. The instrument is also designed to minimize the cool-down and clean-up times between tests.